Jordin Canada and Monique Billings run another fast break. Photo courtesy of UCLA Athletics. 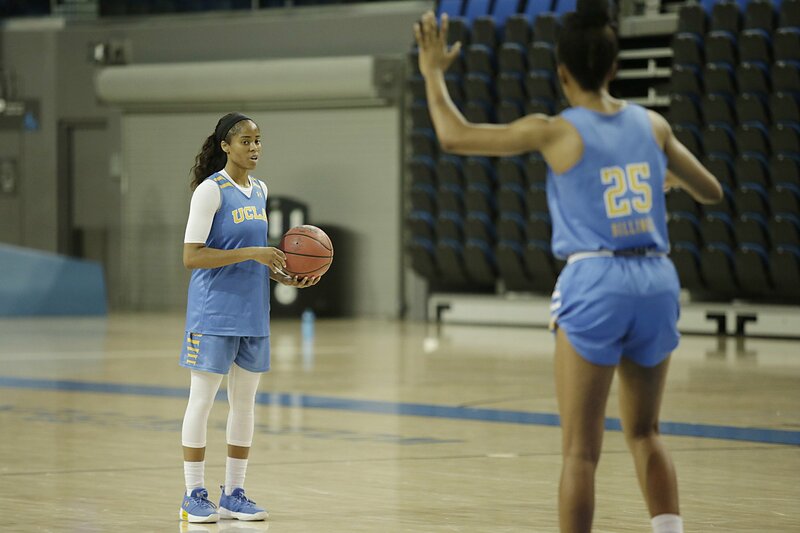 UCLA coach Cori Close remembers the first few weeks of practice for incoming freshmen Jordin Canada and Monique Billings, in the summer of 2014. 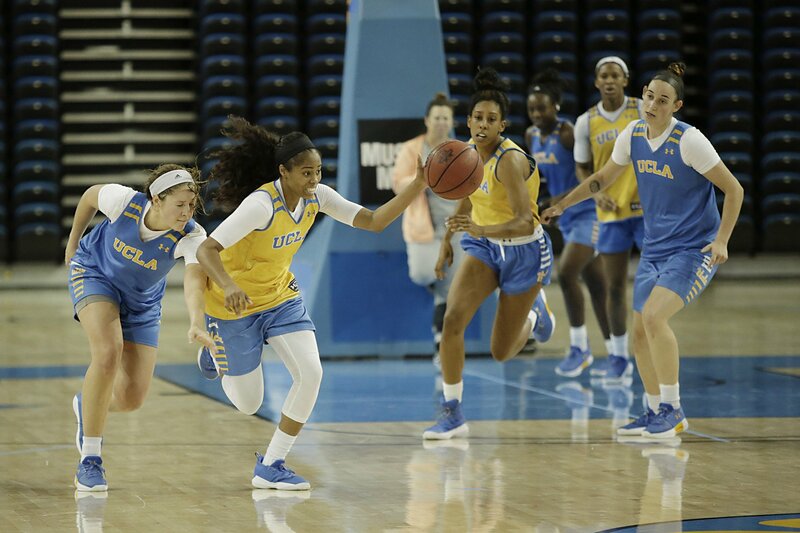 Fast forward to the first week of practice earlier this month, and the evolution of last year’s top two Bruin scorers and rebounders is striking. A vocal Canada now pushes practice players, stealing the ball from them and snatching rebounds. Billings routinely beats many of the guards on sprint drills, while dribbling the ball. They practice with the kind of intensity that they have shown for the last two seasons, especially, as they led UCLA to back-to-back NCAA Tournament Sweet 16 appearances. Both made the All-Pac-12 team last spring – Canada, for the second year in a row. Monique Billings, No. 8 and Jordin Canada, holding plaque, celebrate winning the Four Nations Tournament with the USA Basketball U23 team in August. Photo courtesy of USA Basketball. Each athlete took it even further over the summer, when both were named to USA Basketball’s U23 team. They traveled to Japan, where they helped the U.S win the inaugural Four Nations Tournament. “It was mind-blowing,” Billings said of the experience. Canada was at a loss for words to describe her feelings. “I don’t even know,” she said. But their career statistics at UCLA speak for themselves. Canada broke the school’s single-season assists record last year, with 242, tied the single-game assists record with 16 in the first round of the NCAA Tournament, and led the conference in assists all season long. 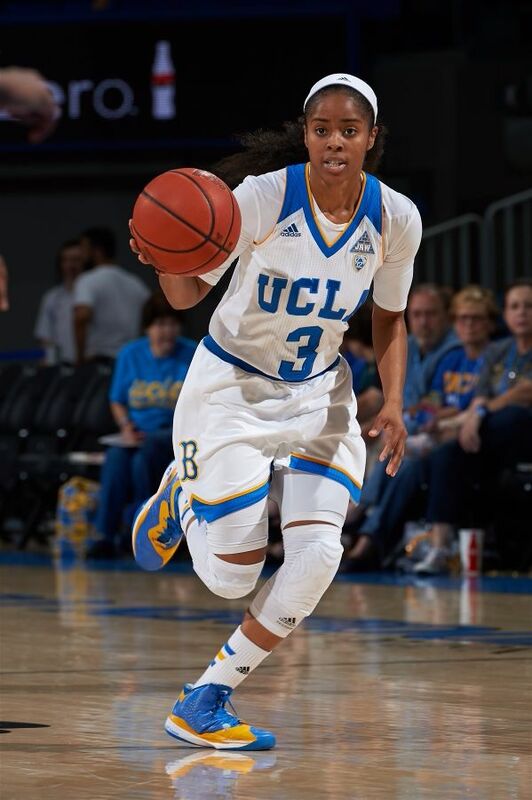 She became just the sixth Bruin to record a triple-double, and she ranked ninth in the nation in assists. Billings broke UCLA’s single-season rebounding record and tied the single-game mark with 25 during Pac-12 play. She also broke the single-season blocks record last season, with 66. She almost tripled her statistical output from her freshman year, and averaged a double-double last season. The combination of personal breakthroughs and leading the program to a higher level has got Close thinking she might see both Canada and Billings in the Bruin Hall of Fame someday. Off the court, the growth trajectory of Canada and Billings has been just as exponential. They have become more confident, and each has developed into a leader, ready to push their team to even greater heights in their final season. “I’m staying focused, motivated and determined to get to where we want to go, and that’s the Final Four hopefully for us this year,” Canada said. In contemplating what lies ahead, which will likely include being drafted into the WNBA next spring, both Canada and Billings sound older than their years in that they are taking a one-step-at-a-time approach. Monique Billings passes to Jordin Canada during a recent practice session. Photo by Maria Noble/WomensHoopsWorld. Canada said she won’t hold back. That includes another run through the talent-laden Pac-12, which had the highest RPI in the country last year. Jordin Canada weighs her passing options with Monique Billings defending her. Photo by Maria Noble/WomensHoopsWorld. Billings said her lens as a senior has caused her to reflect. The persona of both athletes is more relaxed than it ever has been during their time in Westwood. Their lighter approach has been helped by the team newcomers, whom Close characterizes as a boost for her two stars. Close realized the fierce, driven natures of Canada and Billings a long time ago, and has been pleasantly surprised to see them ease a bit this fall. The mature outlook of both players, who have been scouted by WNBA coaches since they were sophomores, has been hard-won, on their own terms. Both were part of the Bruins’ five-woman, No. 1 recruiting class of 2014 when they arrived on campus. But that, and their on-court intensity, was about all they had in common. Canada, the youngest of two children, is a small guard from West Los Angeles who began playing basketball at age 6, and was receiving interest from colleges by seventh grade. Quiet and shy off the court, Canada was a beast on it, and she was ranked sixth in the nation in her high school class. Billings is the oldest of two – a tall, reedy forward from the Inland Empire who didn’t take up hoops until she was in fourth grade. Outgoing and charismatic, Billings was known for a long time more for her incredible athleticism than her basketball skills. She was ranked 37th in UCLA’s heralded class behind Canada, Lajahna Drummer, Recee’ Caldwell and Kelli Hayes. UCLA’s 2014 No. 1 recruiting class in June of that year: Jordin Canada, Kelli Hayes, Monique Billings, Lajahna Drummer and Recee’ Caldwell. Photo by Aubrey Yeo/The Dailey Bruin. Because of the stature of the class, the Bruins entered the 2014-2015 season ranked. Then they dropped their first four games and fell from the top 25. Three more losses by the end of December and they were 4-7 going into Pac-12 play. They ended 8-10 in conference and lost in the Pac-12 Tournament’s second round. But a surprise run in the WNIT ended in a 62-60 win over West Virginia for the Championship, which included a 31-point outpour from Canada. The title gave the whole season new meaning, and filled the team with inspiration. Shortly afterward, however, Caldwell announced she was transferring to Texas Tech University. The news was especially hard on Canada, who had become good friends with Caldwell. 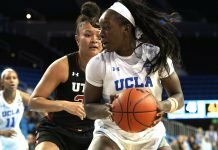 That, coupled with disappointment in her own season performance, caused Canada to contemplate transferring from UCLA herself. But in the end, she opted to stay. Billings, meanwhile, worked on her game all summer long, and looked better than ever entering her sophomore year. She joined Canada as a starter, and has not missed a game since. The Bruins began the 2015-2016 season unranked, but climbed into the top 25 just weeks later after losing only two games – close ones – to ranked South Carolina and Notre Dame. They finished the year 22-7 overall and 14-4 in conference play, and lost to Oregon State in the Pac-12 Tournament Championship. 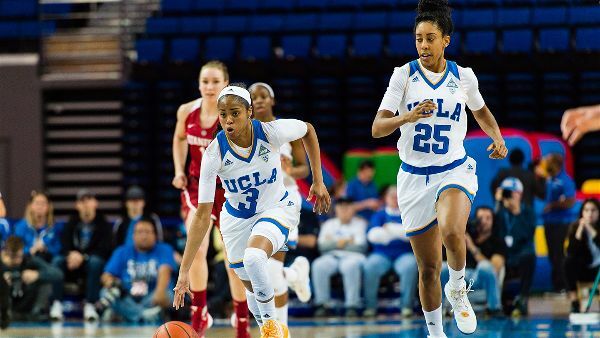 UCLA advanced to the NCAA Tournament Sweet 16 round for the first time since 1999 before losing to Texas. Following that showing, Canada and Billings returned for their junior years as changed athletes. Jordin Canada’s vocal leadership and poise took the Bruins to another level in the 2016-2017 season. 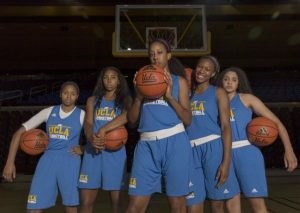 Photo courtesy of UCLA Athletics. Canada became a true floor general, shouting instructions to teammates in every game while maintaining a steely composure through physical conference play. Billings showcased an improved skill set that she combined with even greater athleticism, which thrust her into the national NCAA spotlight. The duo was suddenly in the conversation for best high-low combination in the country. 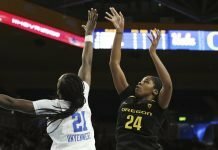 The season had its ups and downs, including a pair of losses to both the Washington and Oregon schools – the latter of which resulted in a two-hour team meeting in the visitor’s locker room at the University of Oregon. The Bruins worked it out, won their last four games and again advanced to the round of 16 in the NCAA Tournament. 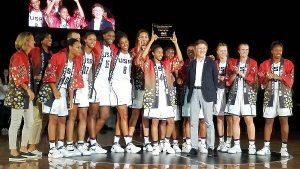 Canada and Billings took the lessons from the past three years, as well as those from USA Basketball, and grew them into wisdom. Each said their goal this season is to lead the team and prepare the younger players to carry on after they leave. Canada realizes that being a role model comes with responsibility. Asked if they felt responsible to teach the younger players so they could carry on their legacy, Canada and Billings turned serious. “Yes,” they answered in unison. Hard work and a hunger to succeed has propelled both Canada and Billings to the top, and that has included work on their mental outlook. Because as much talent as each has, it took them both a while to understand it for themselves. 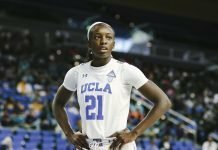 Canada said her self-esteem has grown most since she arrived at UCLA. 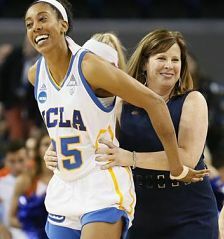 Monique Billings, left, and coach Cori Close, right, smile after UCLA’s defeat of Boise State in the first round of last yaer’s NCAA Tournament. Photo by Danny Moloshok/Associated Press. Billings realized she must be her own advocate, and that she should always follow her instincts. Each athlete has also assigned basketball its proper role in life. Canada said she has remembered why she first started playing the game. Close said watching Billings transform from a raw, unpolished athlete with great potential to who and what she is today has been amazing. As a court coach for U23 camp, Close saw it first hand. 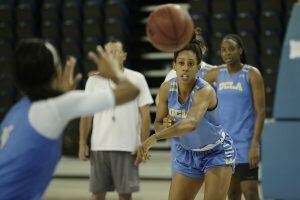 Canada came to UCLA with strong offense, and she has worked to become one of the best defenders in the country, Close said. The relationship between coach and athlete has grown leaps and bounds, too. The growth of the two Bruins hasn’t been lost on their parents. Joyce Canada said her daughter has matured in every way. Jane Billings said she has been impressed with Monique’s strength. Canada, Billings and UCLA begin their quest to reach the Final Four in earnest next month, as they host both Baylor and UConn. Jordin Canada and Monique Billings initiate the fast break in practice. Photo by Maria Noble/WomensHoopsWorld. Billings said they plan to attack the year. See also: Checking in with UCLA’s Monique Billings and Jordin Canada. Lowering the rims: the real question is, what is basketball?